Eichler explains new bill banning publication of victim's name before approval, asks Shaked why privacy censor law isn't enforced. 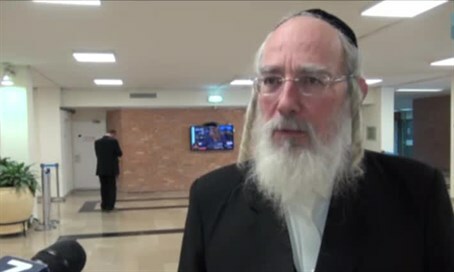 Haredi MK Yisrael Eichler (United Torah Judaism) on Monday spoke to Arutz Sheva about the bill he recently submitted, which bans the publication of the name of a terror victim before official approval is given. The new bill comes amid the current Arab terror wave which began last September, and which has been accompanied by countless rumors and mistaken publications about the names of those killed or wounded in terror attacks. "Sometimes they are false rumors. What's worse is a correct rumor that reaches the family from an irresponsible publication through unofficial means at a time of war, terror attacks and distressing and embarrassing events," explained Eichler. The MK emphasized that in a digital age of social media, the harm from such publications is massive and often impossible to repair. Eichler has demanded from Justice Minister Ayelet Shaked (Jewish Home) to know why indictments have not been submitted against those who publish shocking pictures without blurring out the identifying features of terror victims, in violation of the personal privacy laws amended in 2011 by UTJ MKs Moshe Gafni and Uri Maklev. In a question he submitted to Shaked in the Knesset, he asked to know why there is no enforcement of the law against those publishing uncensored pictures and films which harm the privacy of the victim. Additionally he asked how many related cases were opened in the last five years, how many rulings were made and what were the punishments handed out to violators of the law. "It is cruel to harm the victims and add to the pain of the families out of a wild desire to film and spread shocking pictures that cheapen the value of life in the eyes of the viewers of the pictures, and dull the feelings of mercy and compassion and destroy the sensitivity of a man's soul," emphasized Eichler.